War-torn African refugees are in for harder times. The United Nations World Food Programme (WFP) has announced that it will have to cut the daily ration of refugees mainly due to lack of funds. The UN agency currently faces a fund deficit of $225 million. The drastic cut in food supplies will affect an estimated 800,000 refugees in Central African Republic, South Sudan, Chad, Uganda, Mauritania, Mozambique, Ghana, Liberia and Burkina Faso. 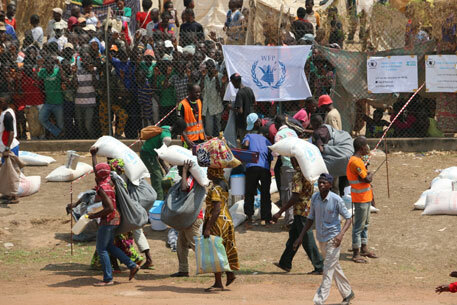 According to the UN, 2.4 million refugees across Africa depend on its agencies for food. WFP says it needs $186 million to restore full rations and avoid further cuts through the end of this year. In addition to difficulties in funding, WFP attributes the cut in supply to security concerns and difficulty in shipping of food by road. It calculates that rations for 338,000 refugees in Liberia, Burkina Faso, Mozambique, Ghana, Mauritania and Uganda have already been cut by five to 43 per cent from its standard assistance of 2,100 kilo calories per day. The agency has said that many of the refugees who are already getting less food than they need are showing “unacceptable levels of malnutrition”. This has also led to stunting and anaemia in children. In a telephonic interview, WFP spokesperson Peter Smerdon told a media house that the long-term consequences of malnutrition could be serious. If a child from the first 1,000 days of conception does not receive the nutrients that the body needs to develop, it will have life-long consequences on the health of the child, he said. The conflict is South Sudan is particularly disturbing for the UN, as large numbers of families fleeing the fighting continue to cross over to Ethiopia and Sudan. Last month, the world body warned that the country can only avoid famine if a shaky ceasefire holds and the displaced people return home in the next few weeks to plant crops before seasonal rains begin, reports another media house. “The situation in South Sudan is very worrying. There is no peace and the rainy season is about to start and not many people cultivated the land due to the fight that is going on. We might have a very dramatic food security problem inside South Sudan, with very large outflows of refugees,” Antonio Guterres, UN High Commissioner for Refugees, told the media house. Lack of food also results in crimes and social problems. “When we reduce rations to less than 500 or 600 kilo calories, there are negative coping strategies that are then pursued, as in families borrowing at very high rates of interest, women unfortunately being forced into situations where they are use whatever means necessary to access food for their children,” Ertharin Cousin, WFP executive director, said at a news briefing in Geneva.